Why do we show outputs as Delta 60 (Δt 60ºC), Delta 50 (Δt 50ºC) and Delta 30 (Δt 30ºC) for cast iron radiators? How do I calculate the heat output I need from my cast iron radiators in a specific room? We have been manufacturing Cast Iron Radiators for over a decade and have assembled tens of thousands of cast iron radiators in that time. End caps on cast iron radiators are not interchangeable as they have left hand and right hand threads, therefore, if you have a non standard cast iron radiator configuration – you must contact us. By default, all Cast Iron Radiators assembled in the UK are configured ‘Bottom Bottom Opposite End’ or BBOE. 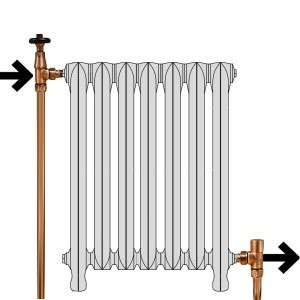 This means that the connections for the Radiator Valve and the Radiator Lockshield are expected at the bottom as detailed in the below diagram. 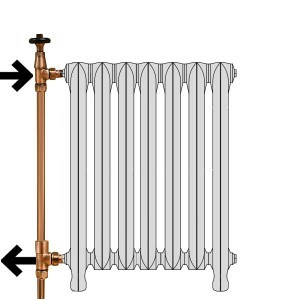 If you do not specify that you need a different type of cast iron radiator, your radiator will arrive with BBOE connections. In Europe it is common to have Valve and Lockshield connections on the same end. This is referred to as ‘Top Bottom Same End’ or TBSE. If your cast iron radiators need to be assembled with this type of connections, you must contact us on 01723 321 000 as you will need different end caps. The final configuration is Top Bottom Opposite Ends – TBOE. 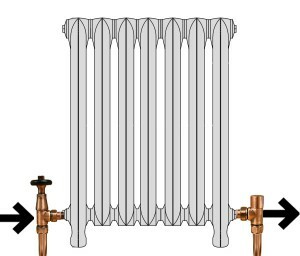 As before, if you would like your cast iron radiators in this configuration TBOE – you must contact us at the time of placing your order so that we can supply you with the correct end caps. If you have any questions on the above, please do not hesitate to contact us on 01723 321 000.